I just came back from a family vacation in Disney World. I love going to Disney World. I love walking up Main Street, USA. I love the smell of the carmel apples on the corner. I love the smiling, perpetually happy, employees. It’s like being in the Capital during The Hunger Games. 1. If you are trying to meet up with friends or family in the park, you will never run into them. But the guy who sat behind you on the tram from the parking lot? You’ll see him at least 4 times during the day. No idea why that happens. 2. According to the My Disney Experience App, a 40 minute wait is considered “moderate.” Alter your expectations accordingly. 3. If you are sharing popcorn, buy the smaller separate boxes. The “souvenir cup” is the worst souvenir you can get. You’ll carry it around all day, lose the cover, and never use it again. In fact, if you bring it home, you’ll keep it in your cabinet because you’ll feel guilty throwing it out, but you won’t have any practical use for it. It will lead you down a twisted path of Disney Hoarding. You do NOT want to go there. Just don’t buy it in the first place. 4. The cheapest light-up toy in the park is an unadvertised plastic “ice cube” that you can buy at a restaurant. If your kids are young enough, you might be able to sell them on that. You can also buy Mickey Straws for $.65 at the fast food restaurants. 5. Those light-up balloons are $18. I think of that every time I see one floating away during the fireworks show. And when I see my kids tossing their light-up ice cubes. 7. 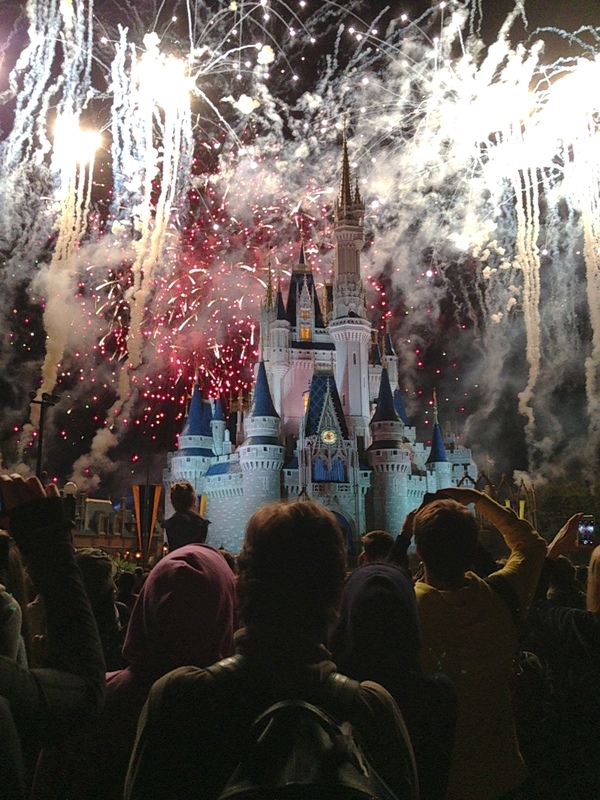 No matter where you stand for the fireworks show, the tallest people in the park will suddenly appear in front of you. 8. Speaking of the fireworks show, even though it takes place in the SKY, your kids will complain that they can’t see. Even before the tallest people show up. 9. All the toilets in the Magic Kingdom have automatic flushers. This was a problem for my daughter who was terrified that she was going to somehow get sucked into the toilet like a Ministry of Magic employee. However, the bathroom in Liberty Tree Tavern is the only bathroom in the park that does NOT flush automatically. Finding that was like striking gold. 10. If there is a line for the Hall of Presidents, just leave the park. You won’t be getting on anything. 11. If you want to engage in some philosophy, head over to Goofy’s Barnstormer and look at the people who stand in line for an hour for a ride that lasts one minute (I’m not exaggerating here – one minute long, including the 30 second slow initial lift to the top). That’s when I question mankind. 12. Most Disney employees will play along with whatever stupid games you throw at them and it’s a great way to kill time while you are waiting. My son would walk over to an employee and say, “You want thingamabobs? I got twenty,” and wait to see who replied with the rest of the lyric, “But who cares? No big deal. I want more.” Another fun game to play is to decide which Disney job carries the highest suicide rate (recommended for older kids, mind you). 13. A while ago there was a Disney fact floating around that if you yell “Andy’s coming!” to any of the Toy Story characters they will instantly fall to the floor and pretend to be”toys” again. We tried that when Woody and Jessie were posing for pictures. We were asked to leave the area. Maybe it’s only a Disneyland thing. 14. There is an intangible Disney feeling that permeates the four parks and the surrounding areas. You look at all the Mickey paraphernalia and imagine renovating your kitchen to match the black, red, and white accessories available in various kiosks. You wear mouse ears without a second thought. But once you leave and find yourself a few miles down the turnpike, the magic disappears and is replaced by an overwhelming feeling of stupidity. It is further exacerbated when you get your credit card bill. 15. There’s this new FastPass+ service (no more Fast Pass Kiosks, by the way) that asks you to choose three rides you want to go on during the day that you don’t want to wait in line for. The line for the FastPass+ service is always longer than the current wait time at the ride you are trying to get a FastPass for. But, if you decide to run and get on line for the ride without the fast pass? By the time you get there, the line will be twice as long. Basically, you’re screwed either way. 16. There is a reason children under three are free. Truth is, I still love Disney. I keep going back year after year. Even with the insanity, it still is the happiest place on earth. I would throw “Carousel of Progress” into that one as well. I could relate to a lot of this! I did want to add that there is one other spot I know of with a non-automatic flush. One of the stalls in the Baby Care Center! My daughter was afraid of the auto-flush toilets, too.